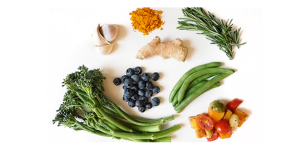 L.A. Brooklyn Bridge Boot Camp | Get glowing & slow aging with The Anti-Inflammatory Diet var scss_share_image=""
Have you ever woken up feeling puffy, bloated and lethargic? Have you ever had to deal with breakouts or random headaches? How about joint pain and digestive issues? All these can be signs of inflammation. When our inflammatory response is healthy, our white blood cells protect us from disease. However, when we go into a chronically inflamed state, our defenses can break down and cause disease. Chronic inflammation is the root of most disease, including heart disease, pre-mature aging, Alzheimer’s, cancer, diabetes and rheumatoid arthritis. The good news is we can take control of our diet to ensure an anti-inflammatory response and a glowing and healthy body. Foods high in sugar and white flour: Pastries, wheat, yeast, pasta, white rice, white bread, and sugar create blood sugar spikes, which in turn create inflammation in your body. Typical symptoms are puffiness, achy joints, sluggish digestion, and water retention. Milk and animal fat products (in large amounts): Make sure you choose organic and free-range chicken and meat. These animals are grass-fed, not grain-fed, which provides you with a larger amounts of anti-inflammatory omega-3 fatty acids. Omega-6 fatty acids: These come mostly from vegetable oils, such as sunflower oil, peanut oil, soy oil, cottonseed oil and safflower oil. A high ratio of Omega-6 versus Omega-3 fatty acids makes your body more inflamed. Use olive oil instead and take fish oil supplements. Fructose: Many refined foods contain fructose (high-fructose corn syrup, for example) and these drive your insulin levels up. This can lead to insulin resistance and chronic inflammation. Overcooking foods: Whether it is oil heated too high or eggs overcooked or foods containing trans-fats – they all have a pro-inflammatory effect on your body. Turmeric, ginger, garlic and rosemary contain potent anti-inflammatory power. Add turmeric to your curry dishes, make ginger tea from a fresh ginger root and add rosemary to your roasted sweet potatoes. Add garlic to your stir-fries or even add a clove into your smoothies. Omega-3-fatty acids: Fatty cold-water fish, such as herring, mackerel, salmon (ideally wild-caught) lower inflammatory markers and boost your HDL, which is the healthy cholesterol, while lowering LDL (the inflammatory type). Blueberries: High in antioxidants and lower in sugar than most fruits. Tea: Matcha tea (powder) and green tea are loaded with antioxidants. Lots of green veggies: Eating lots of greens ensures you are supplying your body with fiber to keep your blood sugar balanced, as well as Vitamin C (a potent antioxidant and cell protector) and enzymes to ensure proper digestion and nutrient assimilation (if you’re nutrient deprived your body’s anti-inflammatory powers are suppressed). Remember that every meal sends your body a new message, so if you eat a pro-inflammatory food, you can always balance your body with a nutritious meal.